Ecommerce brands have seen innovations spring up for all parts of their business to help them compete more effectively with Amazon. Shopify makes it seamless to launch a great storefront. Instagram helps you build your audience (and even sell directly!). Whiplash and Shipmonk handle your fulfillment. Fuse Inventory and Stitch Labs manages your inventory with an extreme level of sophistication. Despite the rapid growth in international sales, there hasn’t been an international shipping carrier built for the modern ecommerce brand. In the US and abroad there has been innovation around the last mile. For example, you might use Axlehire for your last mile deliveries in the U.S. or Ninja Van in Singapore. However, if you want to send products from the United States to your customers abroad, you’ll basically have to choose from the USPS, DHL or FedEx. The latter being the youngest, having been founded in 1971. Schwartz, who ran a consumer brand for nearly a decade, felt this pain himself. “We had thousands of international visitors to our website every month, even though we didn’t do any marketing. They found us through Instagram, Facebook, and press. But shipping to them? It was awful. Clients would receive tracking information, but the details would never update. Packages would be lost. And it felt like no matter what the issue was, the big carriers would throw their hands up and say ‘not our problem’”. 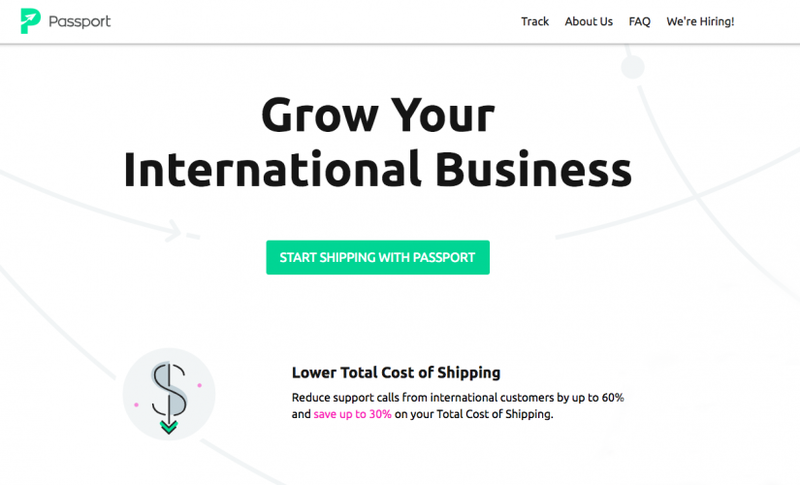 Thus they founded Passport, with a mission of building “The most beloved international shipping company”. So, one year in, how are they doing? “We’re on our way”, jokes Yancher. “It’s a long journey, but we’re excited about our team, product and customers.” The company is nearing $2 million in annual shipping sales, some of which are from fast-growing brands like Native, the natural deodorant brand that sold to Procter and Gamble for $100 million in 2017. The company’s lead investor is Resolute Ventures. Says Raanan Bar-Cohen, the partner who led the round: “We invested for two reasons. First of all, we bet on the team. Passport has expertise in logistics, customer experience and building complex digital products. They also have run consumer brands and literally felt that shipping pain. And second, the market is huge and the pain is real. Brands are leaving money on the table because they’re afraid of stepping on the gas with global sales due to shipping pain.” Other investors include Precursor Ventures, Carly Strife from BarkBox, Ryan Hoover from Product Hunt, April Underwood from Slack, and Tommy Leep from Jetstream. Parcels move through Passport’s curated network of carriers, a “virtual delivery network”, in Yancher’s words. “We’re not two guys and a truck. We find the best private carriers and Posts all over the world and partner with them directly”. Tony Chen and Misha Moskovtsev, the team’s CTO and VP of Engineering, have led development of an infrastructure that allows Passport to swap shipping partners in and out. If a better delivery partner becomes available in a city, say, Sydney, Passport can directly connect with that partner for all parcels going to customers. Yancher built these types of custom routes at his previous business, Lynks, which was one of the largest shippers to the Middle East. Passport recently moved out of stealth mode and is starting to engage with dozens of Third Party Logistics partners, or “3PLs”. These are the operations experts who run warehouses that handle logistics for hundreds of brands. Passport has had success in winning accounts like XB Logistics and Fulfillment Works because the 3PL often bears the brunt of a brand’s frustration; removing a customer service ticket can be worth a few dollars. Moreover, Passport’s promise to brands is that if they can improve the experience for cross-border shoppers, then sales will grow, which means more orders to pick and pack for the 3PL.